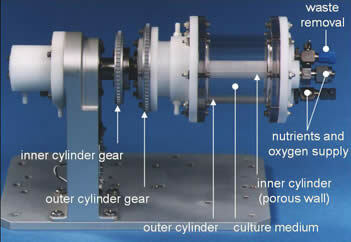 A rotating wall bioreactor is used to perform Earth-bound tests that simulate a low gravity environment for microbes. The bioreactor is a small cylinder that rotates slowly, keeping the microbes in a constant state of free fall in a liquid growth medium. Salmonella (the second leading cause of gastric distress in the US) gets worse under these conditions, making it more resistant to heat and stomach acid. Weightlessness alters the genetic expression of microbes; the genes affected cover the full range of cell function. This is not just a problem for the health of astronauts on long missions. It also affects any other natural biological process that is mediated or assisted by bacteria. Science fiction fans may recall sours from Bruce Sterling's 1985 novel Schismatrix; biological problems surfaced when microorganisms were subject to low gravity for long periods. Take a look at Microscopic Astronauts at nasa.gov. Enthusiasts will enjoy the Gene Expression Omnibus and the Stanford Genomic Resources page.